I'm now part of a group of dog folks posting on a brand new and truly awesome blog (if I do say so myself). We call ourselves Team Unruly and the folks who write for the blog do almost everything you could imagine with their dogs: agility, rally, obedience, conformation, dock diving, hiking, camping, Schutzhund, and more! It's a fairly diverse group of people but we all have a couple things in common: (1) We're all mostly positive reinforcement trainers and (2) We all love our dogs! So if you'd like to check out Team Unruly, you can find the blog here. And if you're a Facebook type, you can join us on Facebook here. We'll occasionally be having contests. We've had two already: two folks won gorgeous collar charms from NatInDesign and two folks won amazing fleece tugs by Red Dog Tugs. So if you're interested in the blog, you'll definitely want to "like" the Facebook page so you can get in on all the good stuff going on there! Besides that, Dahlia and I continue to go to agility classes and trials. She's making constant progress and is getting faster, more confident, and more joyful in her runs. She's weaving 6 poles regularly and can weave 12 poles on occasion (we're getting there with those 12 poles!). We're figuring out how to work well as a team. It's amazing to me when I watch her do these runs. She's gaining so much confidence and looking so much more independent. Sometimes I still can't believe this is the same dog I took home all those years ago. She truly has grown into a lovely and joyful dog and that's so important to me. I love my girly. I don't know what I'd do without her! 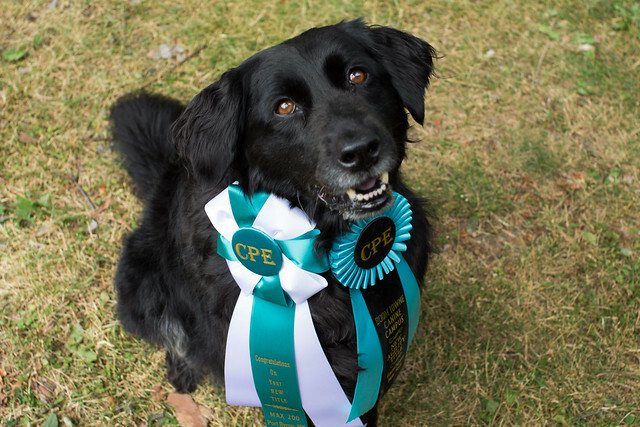 She has two CPE titles now: CTL1-H (Handler's title) and CTL1-R (Standard title). She looks very proud modeling her big fancy ribbons doesn't she? She may not know what they mean, but I think she knows how proud I am of her. Thanks! I really need to update this morning often, but I got so involved in Team Unruly that I just forgot!